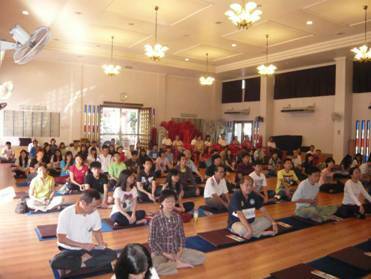 This morning (27-Jan-2012), despite the long weekend holidays and also with the Sunday Dhamma School off, many devotees still turned up at SJBA to attend our Morning Puja Service. The Dhamma Talk this morning was on “FROM PERCEPTION TO STRESS” which was on the Buddha’s Teaching on the Process of Perception (“pañca-khandha”, the 5-aggregates) leading to emotional reaction and craving (“tanhā”) that gave rise to stress and suffering (“dukkha”). The Speaker, Bro. Billy Tan, is a Professional Trainer and Business Development Consultant and also a Certified Master Practitioner of Neuro-Linguistic Programming (NLP), as well as being certified by the International Association of Counselors and Therapists, USA, in Clinical Hypnotherapy. This morning, Bro. 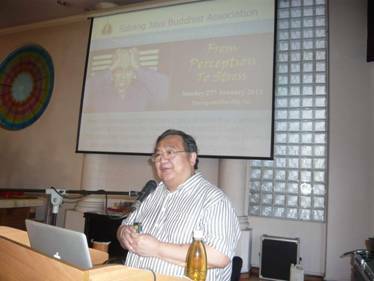 Billy co-related modern Neuroscience and Psychology with the Buddha Dhamma and shared the various techniques one can apply to reduce the harmful effects of stress. It was certainly a meaningful session for all those present, understanding better the source and management techniques of stress. We hope that more members and devotees will take advantage of future Talks SJBA arrange for Bro Billy Tan.